Goldfish are easy to find, inexpensive to buy and simple to raise. Getting them to breed is another story, however, requiring some work. Goldfish in the wild breed naturally in the spring, when the temperature starts to rise a bit. The higher temperatures inspire the fish to spawn. Goldfish in aquariums, however, need more work to spawn. The aquarist must provide them with warmer water, plenty of early morning light to spawn in, and spawning mops. 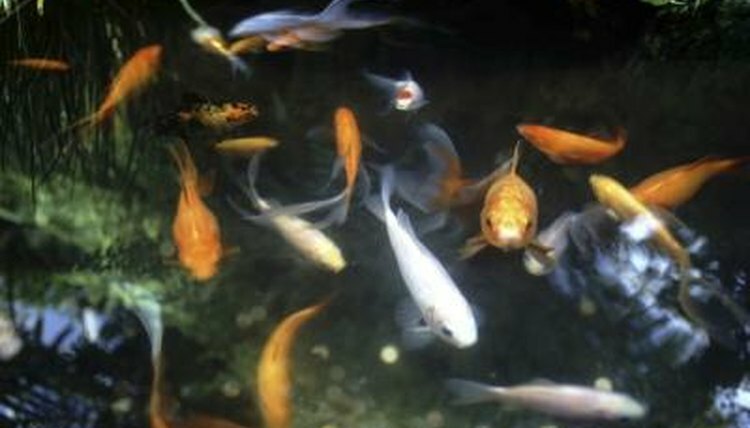 Goldfish spawn under specific conditions. In outdoor ponds these are determined by changing weather. In late April or May, depending on the climate of the region, the goldfish will begin to chase each other. Once the water is warmer, these chases conclude with actual spawning. In an aquarium, there should be more males than females, as well as brighter light in the mornings to inspire the fish to spawn. The goldfish group together, with several males all chasing a female, attempting to rub up against her and stimulate her enough to get her to eject her eggs, which are then fertilized by all of the males. In this way, several male goldfish can fertilize a single female's many eggs. The eggs attach to greenery in the pond and, depending on the warmth of the water, will hatch anywhere from a few days to a week later. Once the tiny fry hatches, he measures only around 3 centimeters in length and is black in color. Goldfish fry are so small that they become lunch for the adult goldfish if they don't have enough places to hide. The pond owner should provide plenty of aquatic plants or sink rocks for this purpose, giving the fry some places to hide. It helps if the water is green so the fry can hide in plain sight. The tiny goldfish can't eat large pellets or flakes, but they can consume tiny flakes and will eat dried tubifex worms if they are broken up small enough for baby fish to get their mouths around. Baby goldfish also nibble on algae that they find on the plants and along the edges of the pond. Algae is actually one of the healthiest natural foods for small fry, as it contains the nutrients they require for growth.